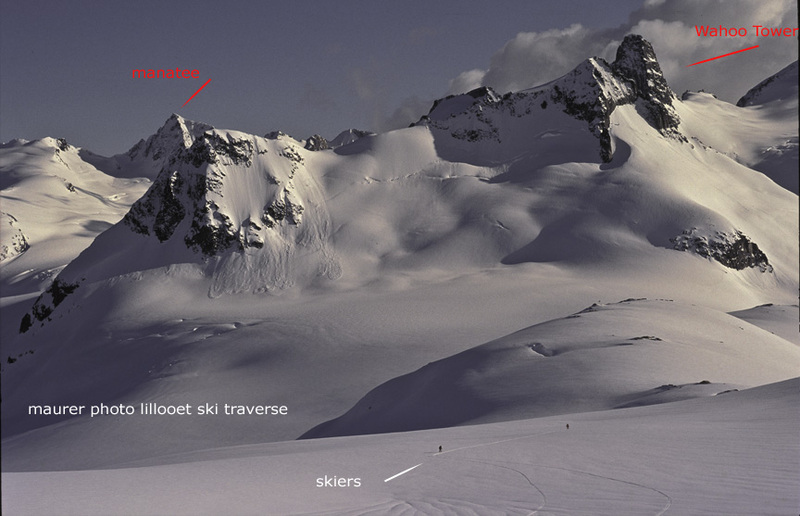 I was fortunate to ski in the Esplanade Range in the Northern Selkirks with Golden Alpine Holidays A truly amazing experience. Super alpine guides great food and fantastic lodges. 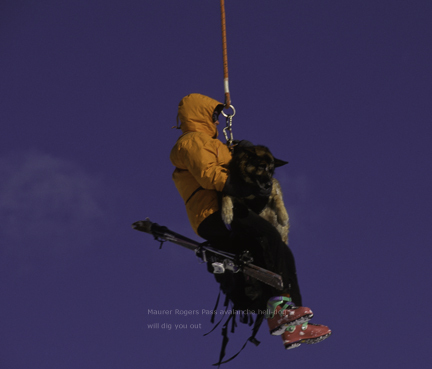 Recommended if you like powder, safety oriented experienced fun-loving guides and terrific mountain scenery. 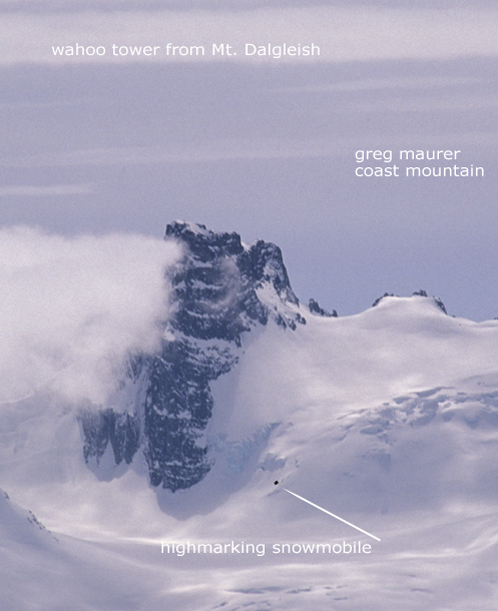 Here’s are a couple of photos from the coast range…..this is a great place to ski out of bounds. 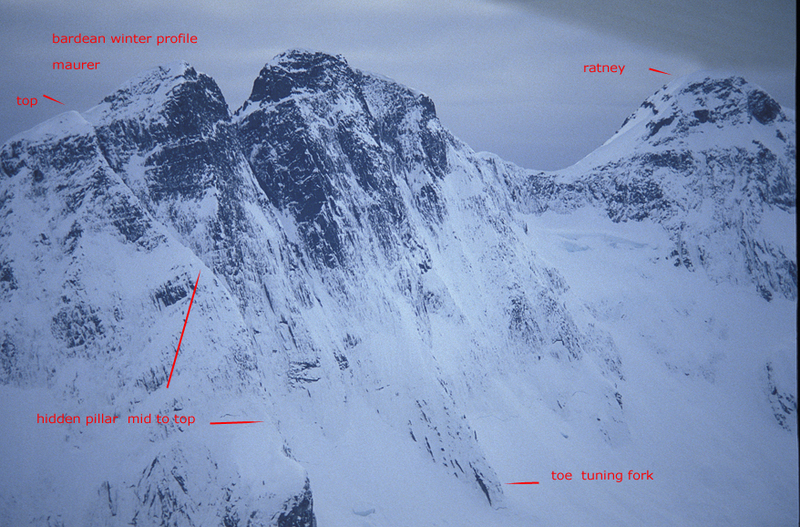 You get good views of some towering peaks too. This side of Wahoo Tower I think has only been done Climbed once A. B. Buttress by Fairley/Driscoll/Durtler I believe that was the combo. The exit off the south side is a piece of duff. You can see this little gem from the summit of Monmouth at the beginning of the traverse. When you are on top of Lillooet and Dalgleish its a bit closer as the Manatee range is a stones throw away. If you have nothing to do for a couple of weeks do this trip its outstanding… you might want to allow a week for bad weather or some Dharma time. Telephoto was 80-200 2.8 ed nikkor maxed at 200mm on a high overcast day. Aside from the Waddington Area there are a some really good rock routes to do. The Serl/Down route on Queen Bess would be one and say something like Warbird in the Klattisine bang a few of those then there’s always the Toba ….. there’s a lifetime of granite out there. These guys will dig you out. But you gotta make sure you don’t get buried. They are pretty efficient at finding bodies. This is my friend Too Much. Some of the best roads we followed didn’t go through. But that didn’t matter. 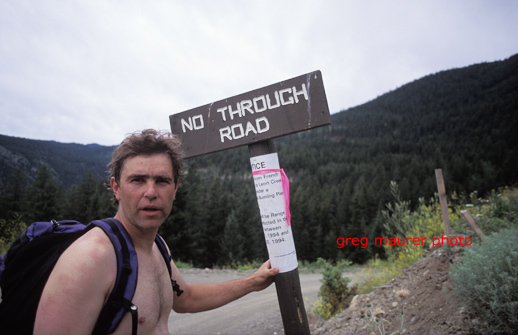 This was taken in British Columbia in the back of beyond it was hot unlike today near Watson Bar 40k away from the truck. 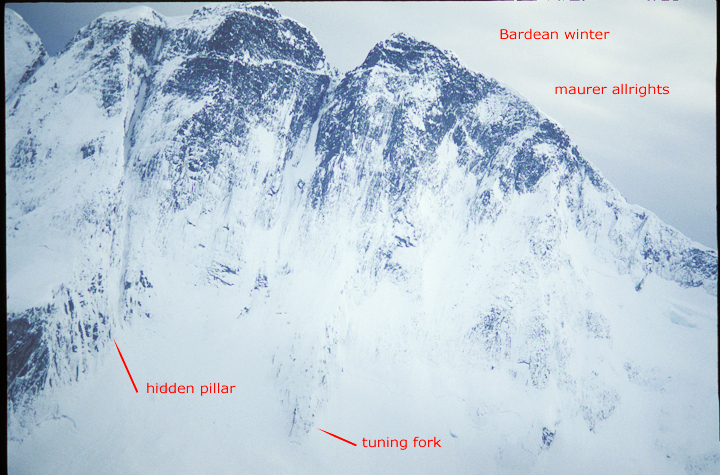 Sharpen your tools that is ice tools…axes crampons and sharpen yer focus too because that is what you are going to need for Bardean in winter. One of the yet to do problems of the local coast mountains so get rid of your bouldering futons and embrace some real winter excitement. The avalanches are over everything has been scoured down to the base layers…. 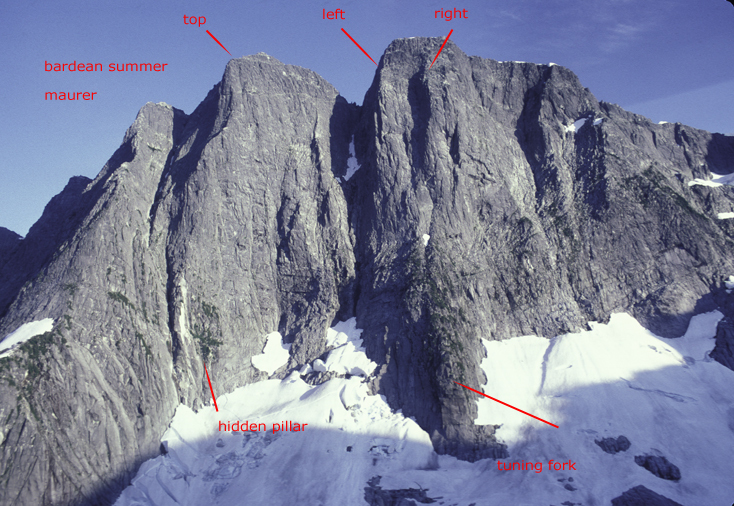 if we get some stable weather the conditions may be right for these once in a lifetime climbs. (Actually the ava hazard is still high due to rainfall warnings 1 deg C at sea level translates into a lot of snow higher so be patient) It’ll be an adventure you’ll probably have to fly in to the base of the climb upper Chehalis/Statlu area. There is a cave halfway up the Tuning fork if you want to hunker down. Rescue will be difficult, so don’t entertain it. It looks a lot steeper than it is, a third of the route is quite steep just look up. All North Americans should read Andrew Nikiforuk’s Tar Sands – he tells the story as is. You will not believe what is happening in ALBERTA CANADA. Take a Stand. Write a letter. We as Canadians/ NAmericans should be totally ashamed this is an environmental travesty. The harvest of bitumen, is not cost effective or sustainable. The clearcutting in Northern Canada’s boreal forest, watershed destruction and chemical pollution air and water, wholesale energy waste and greed is something you would expect to take place in a 3 world country without any moral or ethical conduct or accountability to the world you live in. Do you believe in this? Do you support this? Do you have children? When all is said and done the big oil companies will just walk away and laugh and you/we will be footing the cleanup costs.